Looking for a fast setting beet pulp for horses with alfalfa to complete your horse’s diet? Then reach for Fibre-Beet… a carefully formulated combination of Speedi-Beet, alfalfa and oat fibre – a superb conditioning fibre feed and forage replacer. And 95% sugar free. The horse is an herbivore which has evolved to eat plants and utilize feeds high in fibre. So the natural way to feed your horse is to supply as many nutrients as possible from fibrous feeds before adding anything else to its diet. Feeding a fiber based diet in this way can help to avoid an excess of protein, starch and sugar, and helps to maintain the natural balance of bacteria in the horse’s hindgut. Limiting excess starch and sugar in the diet helps support a healthy digestive tract, maintains overall good health and reduces the risk of laminitis and tying up. Do Not Feed Dry. You can prepare in advance if you wish, but store in cool conditions and feed within 24 hours of soaking. Mixing: 3 Parts water to 1 Part Fibre-Beet®. Soak 45 minutes in cold water, 15 minutes in warm water. If your horse prefers a Sloppy mash add more water to help with rehydration. 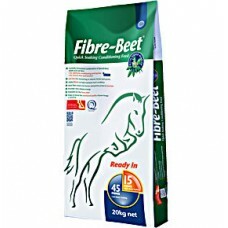 ​Fibre-Beet® is produced by BRITISH HORSE FEEDS, Europe's leading manufacturer of micronized feeds.